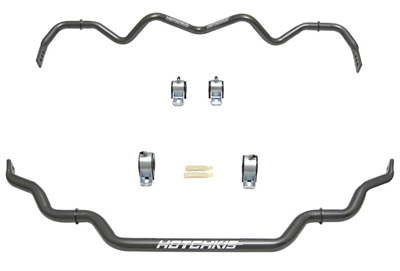 Improve the Handling characteristics of your Nissan 370Z / Infiniti G35 / G37 with the Hotchkis Sport Swaybars Set. The Hotchkis Sway Bars will dramatically improve steering and cornering response of your Nissan 370Z / Infiniti G35 / G37 by reducing the amount of body roll. By keeping the vehicle flatter during the turns the Hotchkis Sway Bars gives the car increased traction providing a more comfortable handle. Your Nissan 370Z / Infiniti G35 / G37 will feel much more crisp and precise around the corners. With emphasis on ride quality, you will feel a huge impact in steering as maneuvering takes a lesser amount of steering input with greater response. Maximize the performance and Upgrade the handling of your Nissan 370Z / Infiniti G35 / G37 with the Hotchkis Sport Swaybars Set. Item #22441 RWD Models Only! Does not fit All Wheel Drive Models. If you have any questions about the Nissan 370Z / Infiniti G35 / G37 Sport Sway Bars Set call 714-582-3330.